Ceasefire Oregon works to prevent gun violence by advocating reasonable, effective gun laws. We educate the public and legislators about gun violence, lobby on behalf of bills that will help make our communities safer, and work to prevent the passage of bills that would make it easier for dangerous people to obtain and carry firearms. Ceasefire Oregon is a non-profit 501(c)4 organization. About 30,000 people are killed by firearms in this country every year. More than twice as many are injured. This is a public health crisis of staggering proportions. Guns are too easily available to felons, fugitives, kids, and people with serious mental health problems. To reduce gun violence, we must make it more difficult for people who cannot lawfully own guns to obtain them. Our sister organization is the Ceasefire Oregon Education Foundation, a non-profit 501(c)3, whose primary focus is education. Their programs include suicide prevention, safe storage of firearms, providing free gun locks to organizations, and the ASK Campaign, which encourages parents to ASK if there are guns in the homes where their children play. Our political action committee (PAC) is Ceasefire Oregon Action Fund. Our PAC is dedicated to electing legislators who will pass strong, effective firearm laws in Salem and Washington, D.C. Please visit our PAC FB page for more information. 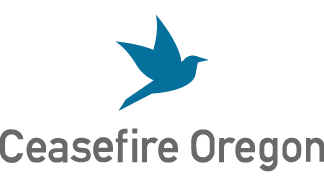 Ceasefire Oregon was founded in 1994 as a grassroots organization dedicated to staging an annual gun turn-in. We subsequently broadened our scope to include education programs to prevent gun violence. In 2001, we formed an alliance with a longtime legislative advocacy group, Oregonians Against Gun Violence (OAGV). The original Ceasefire Oregon became the Ceasefire Oregon Education Foundation, a 501 (c)(3) organization, and OAGV became Ceasefire Oregon, a 501 (c)(4) organization.